Regular readers of my blog may have noticed the prevalence of Indo-Trini foods. And may have deduced accurately that I come from the Indo-Trini community. But the truth is, many of these so-called “Indian” foods are pretty much commonly made and eaten throughout Trinidad and Tobago regardless of family background. Just look at my Trini-Jamaican friend blogger the Trini Gourmet – she has recipes for many of the same foods 😉 although I have to say mine my Mom’s are the best (hehehe). It just so happened that these are the recipes I have worked on making, or writing down with my mother, because I wanted to make them just like that. Especially when away from home. If you’re in the US or UK, the regular Indian foods available won’t satisfy that craving for dhalpuri or buss-up-shut, or our gulab jamoon. Dhal is made and spiced differently. Even the curries, while delicious, don’t taste like ours. These foods are links to my country, my village, my grandparents and parents. And although everyone has their own touch, it was important to me to capture what my slice of Trini life and food tasted like. Especially since there just wasn’t enough on the internet whenever I was looking. But despite the strong Indo-Trini influences, we grew up with some differences compared to some of our neighbours in Central Trinidad. We grew up knowing bulgur wheat, kibbe and falafel. 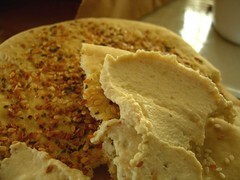 Tahini (sesame paste) and Halawi (sweet made from ground sesame seeds) were much-desired and hard-to-find products. Lentils and lamb. Much lentils and lamb. And not stewed or curried either. We knew we hated shankleesh but Mom was always looking for a supply. Baba ghanoush (roasted eggplant dip), fa’toush (salad with bread bits), khoubz (flatbread) and za’atar were words that Mom tossed around and wanted to make. Now, I know, with the proliferation of restaurants, specialty supplies and knowledge of international foods, some of these things are not all that unusual. But a couple decades ago, they weren’t that common in T&T. We didn’t see all that many people trekking to places in West Mall (?) to find bulgur wheat number 1. Arab foods (or Mediterranean) became more known and popular over the years, more people being able to recognise baklava and kibbe. Pita bread has long been an American supermarket staple. Even bulgur wheat is common, with everyone everywhere making tabouleh. My maternal grandfather was from Syria. There is a significant Syrian-Lebanese population in Trinidad and Tobago (significant both in terms of achievements and presence, despite the small numbers), stemming first from an immigration wave at the turn of the century and then up to the 1930s and 1940s. Although the majority of the Syrian-Lebanese who came to T&T were Christian, my grandfather was actually Muslim. I don’t know if that was relevant to the food culture or if there are any differences in my mother’s Syrian food knowledge and experiences (well, no alcohol and no pork for sure ;-)). We didn’t really have an opportunity to discuss food with my grandfather and relied mostly on knowledge from Mom and her siblings. Who didn’t seem to interrogate their father either 😉 But I guess it was just how they grew up. But it has been interesting exploring this small part of our food history. Ongoing process. We knew from early on that there was a lot of lamb and mutton in the house because Mom grew up with that from her father. And unlike some of our acquaintances, we didn’t expect that it had to be curried. For those of us who weren’t too keen on beef, the lamb and mutton presence was great. Mom was also always growing mint in the yard, alongside the puddina and bird pepper. And the aforementioned treks to find strange, sometimes smelly ingredients.We didn’t realise the fascination with lentils and olive oil also stemmed from the same source, but we knew that it was very difficult to get Mom to make stewed dark brown lentils like the neigbours. Lentils and rice, yes, but cooked together, with well-browned onions. Not pelau! Years later, I realised this was mujaddara, a staple in parts of the Middle East, where lentils and rice or bulgur wheat are cooked together, then topped off with browned onions and olive oil. Mom eventually remembered this dish did have a name, “im jedra”, she called it (same thing, in Arabic, the consonants for the root word remain the same even though the regional variations may change the vowels and pronounciation). I do like this, although Mom and Lilandra seem to like charred onions. I like browned. And then there was the kibbe. A staple at Eid for us. I remember a Lebanese student in the UK remarking that it wasn’t Eid fare for them, rather an ordinary staple. But for us, because of the previous rarity of bulgur wheat, it was for special occasions. Of course, you can get kibbe in Trinidad – Adam’s Bagels in Maraval, or Roxanne’s on Ariapita Avenue, have always offered this Middle Eastern meat and wheat treat. But they have the fried version. Long ovals of wheat, pointy at the ends and stuffed with meat, then deep fried. Nice I’m sure, but Mom made it baked, all spread out in a dish. Although some Arab friends and acquaintances along the way have mentioned to me that they are aware of baked tray kibbe, I still had never seen it. Mom always goes for bulgur number 1 (the smallest grains), any other grade gets zapped in the food processor till very fine. Then she seasons and layers with cooked minced beef or lamb, fried onions and nuts. Bake and drizzle with olive oil toi keep it moist. Mmmm. This is what Lilandra and I saw on the Discovery Travel & Living that night. Down to the zapping in the food processor to make the bulgur and meat fine and paste-y. 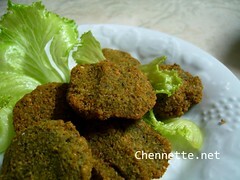 We also had falafels, made from lentils and bulgur wheat. When we traveled out of T&T, we noticed differences in the falafel, many made from chick peas rather than lentils. And they didn’t generally have wheat. Burekaboy recently posted a recipe for falafel and the discussion and the comments highlight some of these variations. It was interesting to know that the wheat is possibly a Syrian-Lebanese variation. It is sometimes hard to figure out in these foods what was a Syrian variation, and what was just adaptation to availability of ingredients in Trinidad. We did try out foods that Mom didn’t make, but that we were used to friends and relatives trekking over from the US or even Syria occasionally. Like baklava. 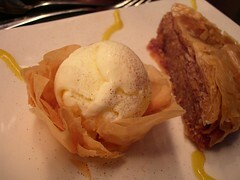 Once phyllo pastry was available…woohoo! 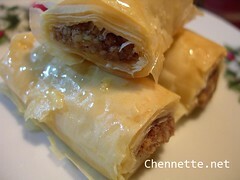 We’ve even tried konaffa/kataifi when the shredded kataifi pastry was available. 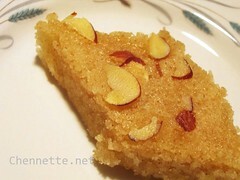 And basboosa, a sweet syrupy dish made with semolina, yoghurt and coconut. Mamoul (little date and nut filled pastries) also, but we made these our own inventive way, with icing. Sometimes green and white (mimicking pistachios) or iced and sprinkled with pistachios Of course, since we hunted down tahini, we had hummus and sauce for the falafel. Mom made her syrian bread, which we ate with lamb and tabouleh. Some of us, like Lilandra learned to love Shankleesh, that soft white smelly cheese rolled in dried herbs. And the flavour of Za’atar, which is a mix of dried thyme, sesame seeds (ground) and sumac. We’re always trying to increase our knowledge of these foods, not just because it’s part of our personal history, but also because it’s good food. I do have recipes for many of these dishes. Recipes from Mom, recipes we’ve developed after trying out many books. I hope to also include these on the blog, because it’s also part of the T&T food culture. I would also love to know the food experiences of the Syrian-Lebanese Trinis, since we only had a small part of it, living down in the sugarcane :-D.
This entry was written by Chennette and posted on May 8, 2007 at 7:33 pm and filed under Chennette, food, life, photos, Trinidad and Tobago. Bookmark the permalink. Follow any comments here with the RSS feed for this post. Post a comment or leave a trackback: Trackback URL. My friend had pita, olive oil and zaatar seasoning and she dipped the pita in olive oil and then the powder. It was good. I was startled and happy even if we had “chips”. She says she puts the seasoning in her eggs sometimes. uhm…we weren’t outcasts…well, maybe you! sigh…how does a menu HAVE to be anything? Alhamdullilah great post and recipes are always there for you . Hmm , lilandra I too love zaatar and olive oil mixed well and eaten with crispy pita bread and diced cucumbers and tomatoes as a side also mixed with zaatar. We have none at home though , will have to make some soon and this time I am adding black seed . I meant mom and her siblings. At least it sounded like that from some of the stories. I could have gotten it wrong tho. @ Lilandra – no need to put controversial family history on my blog!!! very interesting and informative post, chennette 😀 i enjoyed reading it and ogling your (mom’s) food!! it’s very true that we what we grow up with becomes the reference point or compass for judging the same dishes that are served or made elsewhere, be it in the home of neighbour or different city or even country. many years ago, (and much of the food you talk about i also ate), all this was “foreign” food to the people around me. nowadays, much of it has become mainstream but i do remember eating things nobody else ate. or, at least, it felt that way at the time. in the end, whatever one calls a dish or the variations of the ingredients within it, all this is a link to one’s ancestry and makes a strong emotional imprint. btw, i’m leaving here very hungry now ;p also, the way you make the ma’amoul are the same way we make ours and we call them either ma’amoul or menena or burekas. i love the look of the lebbie ones though made from the tabih (wooden mold). Hi burekaboy! Thanks for the comments, especially about the similar experiences! It is so true that everything we try later in life is judged against what we grew up with. Fortunately (or unfortunately) most of what my mother made has remained the benchmark. Which means eventually I’ll master all the things I like, the way I like it 😀 provided I don’t get on her bad side and get banned from the kitchen at home. as for the ma’moul…one year we iced some a very bright almost flourescent green and the others plain white for the effect laid out on a plate. Although the richness of the dates and the pastries don’t usually need much sugar! i made the kunaffa,…i think? We had no digital cameras in those days and the camera we had and the photographer ( Father )was more interested in taking photos of babies and children. Come to think of it we never thought of taking food photos. And we use to have grand dinners when it was officially part of your Dad’s job. So I served food , buffet style and plenty of it and served no alcohol. People enjoyed themselves and would always come to our home as they could expect a fine variety of good and tasty food( self praise). Once I made stuffed cabbage rolls ( grape leaves were not on sale then in Trinidad) and I counted one per person…. that was a mistake on my part , should have counted two as some got none. Chennette was my good and helpful waitress and loved to assist with serving and fixing the table. Perhaps that was a sign of this foodie she is now…..hehehehe…..
WHAT ARE YOU TRYING TO SAY ABOUT ME??? Can we plan our vacation now? Chennette this was such a lovely and informative post. I thoroughly enjoyed it. What I always find interesting is how when a family is made up from various backgrounds whether it be race, religion or from differing countries, that there is often a one-sided influenced cooking that takes place. While the easier answer may be that it is the females (mothers) as cooks that are responsible for this, I have known a number of cases where the males in the households (though not cooking the food themselves) have been the ones that dictate (dare I use that word) the cuisine of the house. That being said, Dad is fairly receptive to experiments and new things. Mom will say she broke him in after 36 years of marriage. to be fair, Mom tries to answer, but then you have to wonder how come she knows something NOW that she couldn’t answer 10 years ago…maybe we drive her crazy! uncle used to bring us super light super decadent super sweet super rich (not dense) from lebanon…or he said it was from the best baklava maker..
Well we did not make the Baklavah as we could not get the filo pastry. So we got from abroad whenever anyone was coming from the Middle East. Also those who came from Caracas brought for us as well. But my aunt , my father’s first cousin on his mother’s side who also married his first cousin on his father’s side was a Syrian(Pita) bread maker and she lived on Abercromby Street in Port of Spain. Not too far from the Red House. This is where all the baking took place and every weekend she had special orders and they were delivered or people collected. During the week there was businees as usual. She also made Shankleesh and Zaatar and sold these as well to the Lebanese /Arab community. The bread was also for the Syrian community. OOh those were good days. those middle eastern treats are great. i love baclava and all the pistachio treats. I don’t think that your grandfather a big cook, but he knew how to do so..he made a syrian version of Peleau, with fresh lamb, rice, chana arab spices with wheat, it was the best, i make it but not like his. from Indian, chinese, creole, italian, west indian and the sweets to go with them. 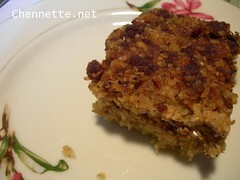 I really do enjoy reading your blog, would probably join and add some of my recipes..
welcome! Sorry I took so long to moderate the comment as I was traveling all day yesterday and only now have some internet access. Mom has made the rice with channa for us (and lamb, or not…) and when she gets the urge the breads too! she’ll say i only ate it once but i was sick and craving things like…macaroni and bread! Hi. I will be visiting Trinidad in a few weeks. My girlfriend and I would like to try some Arab-Trini food. Can you recommend where to go? THANKS! These are mostly Syrian/Lebanese cuisine. I am not sure how much Trini adaptation there is, but I like the food anyway and Adam’s was my source of Shankleesh for the family.